Namrata Shirodkar was at Rajiv Reddy-Kavya Wedding Reception. 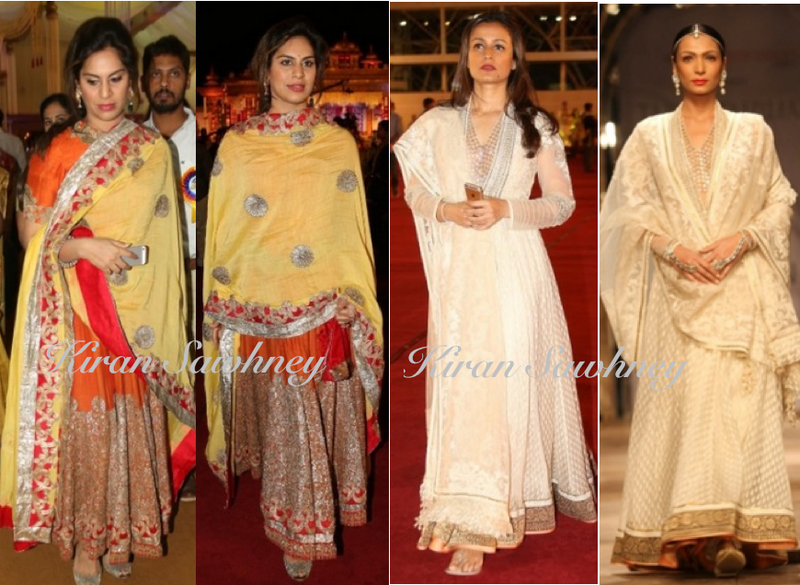 She wore a cream colored long anarkali from Tarun Tahiliani and we love it. We like Tarun Tahiliani as a designer, but here we must tell you that if you visit the designer's showroom (and we are talking about Delhi), his staff is super uncourteous and unhelpful. If you order his creation online, you do not get the same thing that you ordered. Anyhoo, we like love what Namrata is wearing. Wish she had worn mojiris instead of angootha patti chappals that she is wearing. These chappals never feel very rich and elegant. They are certainly not formal. Upasana Kamineni came to Rajiv Reddy-Kavya Wedding Reception wearing Anamika Khanna, complete with the red potli. For us, this look is too OTT. We do prefer Namrata's subtle look more.